For those of you who would rather run stark naked through Oxford Street than face a frenzied crowd of Christmas shoppers (or for those of you who have tried the former to disperse the latter), read on. Because throughout the capital countless Christmas markets are springing to life and bringing with them the promise of steaming mulled wine, sweet roasted chestnuts and more gift ideas than Santa's Grotto. Bringing a festive slice of Germany to London's South Bank, the Cologne Christmas Market really lives us to its namesake. With up to 60 magical wooden chalets selling everything from delectable German grub (think mouth-watering sausages, ice cold beer and melt in your mouth gingerbread) to tree decorations, jewellery and toys, if Christmas is your thing this is not an experience to be missed. Children will be captivated by the beautiful carousel in the centre of the market and will even find that Santa has put in an appearance at Santa's Secret Village (visits to the village must be pre-booked). 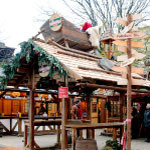 Whilst the Cologne Christmas Market oozes quiet charm and a laid-back atmosphere, Hyde Park`s Winter Wonderland screams bright lights and lots of action. This year the event is planned to be bigger and bolder than ever, with a circus to be included alongside the already dazzling line up of fairground rides, an ice-rink (Europe`s largest), Santa Land (where kids can meet Santa for free) and much, much more. Not forgetting that the venue also hosts its very own Christmas market, you`ll definitely be needing a relaxing glass of mulled wine at the end of this day. It's very easy to be dazzled by the big boys of Christmas markets such as the ones mentioned above. But let's not forget that London is home to some of the best everyday markets in the world which sure as hell don't roll over when Christmas pulls into town. From Camden to Portobello to Smithfield, countless London markets are the place to be when it comes to buying everything from your presents to your turkey (Smithfield Market is a fantastic place to visit to stock up on Christmas grub). Promising unique presents at unique prices, Christmas shouldn't be complete without a trip to at least one of London's true markets.